Watch full Lupin the Third Episode 1 English Dubbed streaming online. Lupin the Third Episode 1 English dub online for free in HD. After receiving a mysterious invitation, Inspector Zenigata arrives in San Marino for Lupin’s wedding to Rebecca Rossellini, a wealthy heiress and businesswoman. It’s soon revealed that the marriage is a sham, and that Lupin plans to steal the Royal Crown of Liberty, a rare artifact given to women to wear on the day after their wedding. Zenigata unravels the plan after someone claiming to be Lupin sends him a message, and begins chasing the criminals. As this is happening, Fujiko attempts to steal the Crown by tying up and gagging a local administrator and stealing his identity. She is captured in the ensuing chase, and Lupin is forced to surrender the Crown in exchange for her release. 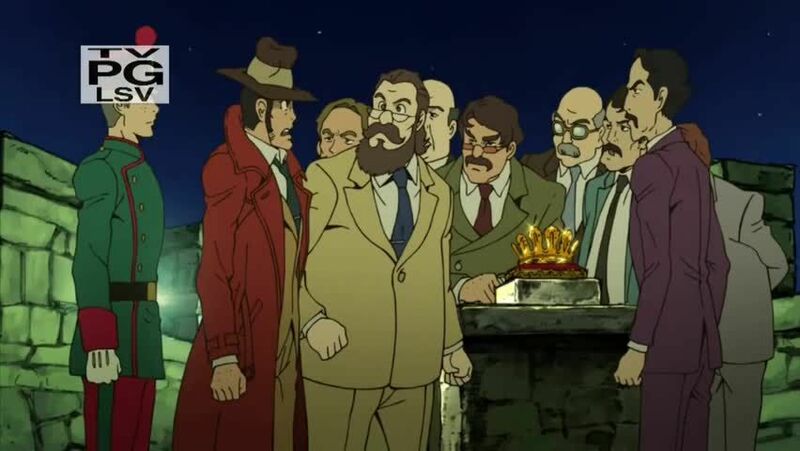 Someone disguised as the local police captain then leaves with the Crown, but is cornered by Lupin. After removing their disguise, it is revealed that the mastermind behind the entire plot was Rebecca, and that she deliberately manipulated Lupin to serve as a distraction while she stole the Crown herself. She manages to escape with the artifact, while Lupin remarks that he should have made her sign divorce papers before she left.